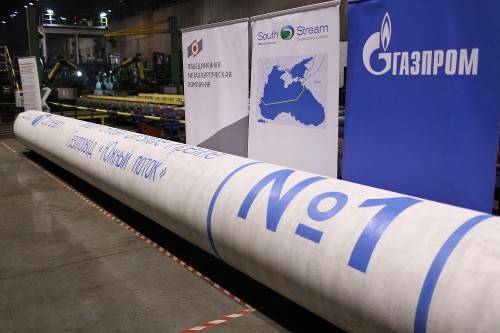 Pipe No.1 for the first line of South Stream's offshore section was produced today in Russia at the Vyksa Steel Works (part of the United Metallurgical Company – OMK), Gazprom said in a news release. Unique pipes for South Stream's offshore section are 12 meters long, 813 millimeters in diameter and have a wall thickness of 39 millimeters. These pipes made of SAWL 450 steel are designed for the super-high operating pressure of 28.45 MPa. Since early April, Severstal (Izhora Pipe Mill) and German EUROPIPE have also been preparing for manufacturing these pipes. The first pipes will be delivered to Bulgarian harbors in early summer, so that the construction of the first line of South Stream's offshore section will start in autumn 2014. South Stream's offshore section will consist of four lines, each exceeding 930 kilometers. Pipe supply contracts for the first line were awarded to EUROPIPE from Germany (50 percent of the total amount), United Metallurgical Company – OMK (35 percent) and Severstal (15 percent) from Russia. Pipes for the second line will be supplied by Marubeni-Itochu and Sumitomo consortium from Japan (40 percent of the total amount), OMK (35 percent) and Severstal (25 percent).